Where does the magic realism come from? Through a spyglassSEWA BHATTARAI Though Sushma Joshi names her book The Prediction, it is not very predictable. Most stories in this collection have surprise endings, or even begin from strange subject lines. For example, there is her first story about a man getting lost in Mongolia, and another about a satellite that crashes among the Himalaya, both very unusual subjects for Nepali writers. Sushma sets the tone right at the start with a very readable story. The Discovery of the High Lama has an intriguing subject matter and enough dialogue so that the reader is not bored. Her plot, too, holds the reader’s interest till the very end. And that perhaps defines most of her stories: unusual subject matters, lots of dialogue, and interesting plots. Once in a while, the Internet sends you a delightful find. And none more so than this one, on Nepali New Year's day. "The End of the World" is listed in this incredible list compiled by Ng Yi-Sheng, who decided to compile a list of 100 books that reflects the world as it is, demographically. The list is available in List Challenges, and it is a list than any author would be honored to find himself/herself in. Not just because its a list of books that I would love to read (all of them), but also because there's a certain sense of comfort and "coming home" to a list that does include the breadth and diversity of the world, as it is. I say this beats any "100 books" list compiled by TIME. 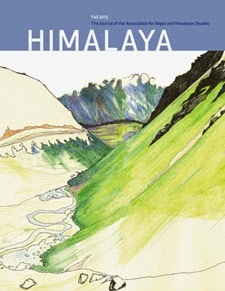 My story "The Prediction" is now out in Himalaya, a journal of the Association of Nepal and Himalaya studies published by Yale University. You can download it here.